Check out AWESOME-tober-fest at my other blog for a Halloween celebration. This year I'm reviewing all things Dracula! 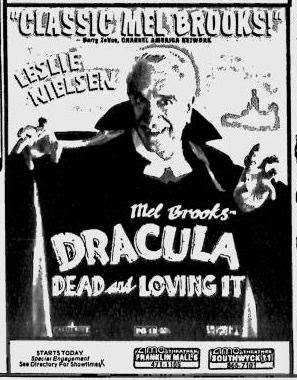 This is an ad for a parody of Dracula starring George Hamilton as the Count. 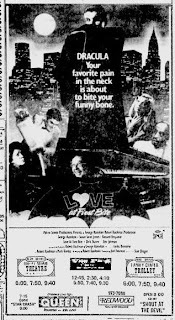 This ad is from May 1979. This is an ad for a 1995 spoof by Mel Brooks starring Leslie Nielsen. Needless to say, it was not as successful as Young Frankenstein.